Lemon Curd, a romantic fiction, was nominated ForeWord Magazine's Book of the year Award Finalist. You may have a look at the Lemon Curd Book Trailer and add your comments. To read a press release, please visit Send2Press or PRWeb. 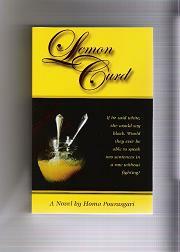 Lemon Curd is currently available for sale at major online bookstores. Lemon Curd was inspired by Homa Pourasgari's travels to England, France and Australia. To learn more about the author, please visit her at homapourasgari.com. Her second book, The Dawn of Saudi - in search for freedom, came out in June 2009. To find out more, please have a look at thedawnofsaudi.com. For those of you who have already read Lemon Curd, feel free to give us your feedback.